Moon i. 1 - £1,450 Some technical flaws can’t dampen this amp’s spirit While a £1,500 integrated is pretty upmarket for Arcam and Cyrus, it’s the very start of the range for Simaudio, whose Moon products extend to distinctly high-end territory with such products as the vast and powerful Titan power amp. But then the Moon i-1 is not exactly a shrinking violet, even though its 50-watt rating is fairly modest by current standards and the unit is not at all daunting to behold. It’s certainly neat and practical, though, as we shall see. Unison Research Unico Secondo - £1,860 An exciting, energetic music-maker with a handy phono stage option A large and imposing amp, this one is also pretty bare-bones, though unlike most it has the option of a phono stage. One of those was provided for review (the price given includes it, a very reasonable £125 on top of the basic model). All kinds of amplifying devices are found inside the case, as the circuit uses bipolar transistors, FETs and valves. There’s very little use of surface-mount parts and most of the amplifying is done with discrete components, though there are a few op-amps dotted around and also some integrated circuits with part numbers intriguingly obliterated. 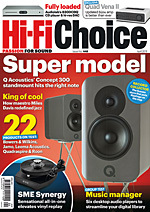 Swede love A £515 power amp with the ability to work in Class A makes the Swedish-made XTZ an attractive proposition, says Richard Black XTZ hails from Sweden and is responsible for the room acoustics measurement system we reviewed a few issues back (HFC 330). The company’s range isn’t huge, but it includes an integrated amp, a CD player, a variety of speakers and some home cinema-oriented electronics and speakers, too. There’s no preamp yet, though we’d be prepared to bet on the imminent arrival of one. Running hot The big thing with this amp is its ability to work in Class A, the ‘holy grail’ of amplifiers that avoids the dreaded crossover distortion by ensuring the output transistors are always passing current.